ISAIAH 26:3 KJV "Thou wilt keep [him] in perfect peace, [whose] mind [is] stayed [on thee]: because he trusteth in thee." 1In that day shall this song be sung in the land of Judah; We have a strong city; salvation will God appoint for walls and bulwarks. 2Open ye the gates, that the righteous nation which keepeth the truth may enter in. 3Thou wilt keep him in perfect peace, whose mind is stayed on thee: because he trusteth in thee. 4Trust ye in the LORD for ever: for in the LORD JEHOVAH is everlasting strength: 5For he bringeth down them that dwell on high; the lofty city, he layeth it low; he layeth it low, even to the ground; he bringeth it even to the dust. 6The foot shall tread it down, even the feet of the poor, and the steps of the needy. Thou wilt keepe him in perfect peace, whose minde is stayed on thee; because he trusteth in thee. "The steadfast of mind You will keep in perfect peace, Because he trusts in You. Thou wilt keep `him' in perfect peace, `whose' mind `is' stayed `on thee'; because he trusteth in thee. The man whose heart is unmoved you will keep in peace, because his hope is in you. 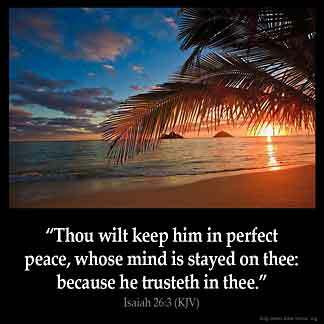 Thou wilt keep in perfect peace the mind stayed [on thee], for he confideth in thee. You will keep whoever's mind is steadfast in perfect peace, because he trusts in you. An imagination supported Thou fortifiest peace -- peace! For in Thee it is confident. The mind stayed on Thee Thou keepest in perfect peace; because it trusteth in Thee. I have tried to keep peace within myself but it is not always there. I love it but don 't really understand it. Sometimes too much peace leads to disarming one 's self from attending to responsibilities and the way God naturally intended us to be. It is obviously awesome but not totally attainable every day. Sometimes are for doing war, sometimes are for grief, sometimes are for work. Expecting too much peace leads to depression for me. Our father is a man of his word if we just obey he says what he means and mean what he says. If we trust in God and keep our mind stayed on Him. He will keep us in perfect peace. A peace that passeth all human understanding.